For other uses, see Wat (disambiguation). A wat (Thai: วัด wat Lao: ວັດ vad, Khmer: វត្ត wōat) is a Buddhist temple in Thailand, Cambodia or Laos. The term is borrowed from Pali vatta, "which goes on or is customary, i. e. duty, service, custom, function". Strictly speaking a wat is a Buddhist sacred precinct with a vihara (quarters for bhikkhus), a temple, an edifice housing a large image of Buddha and a structure for lessons. 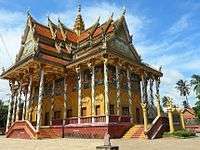 A site without a minimum of three resident bhikkhus cannot correctly be described as a wat although the term is frequently used more loosely, even for ruins of ancient temples. As a transitive or intransitive verb, wat means to measure, to take measurements; compare templum, from which temple derives, having the same root as template. In everyday language in Thailand, a wat is any place of worship except a mosque (Thai สุเหร่า surao or มัสยิด masjid; a mosque may also be described as โบสถ์ของอิสลาม - bot khong itsalam, literally "Islam church") or a synagogue (Thai สุเหร่ายิว - surao yiw). Thus a wat chin is a Chinese temple (either Buddhist or Taoist), wat khaek is a Hindu temple and wat khrit or wat farang is a Christian church, though Thai โบสถ์ (โบสถ์ bot) may be used descriptively as with mosques. 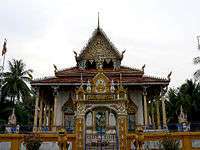 In Cambodia, a wat is used to refer to all kinds of places of worship. Technically, wat generally refers to a Buddhist place of worship, but the technical term is វត្តពុទ្ធសាសនា wat putthasasana. A Christian church can be referred as វិហារយេស៊ូ vihear Yesaou or "Jesus vihear". 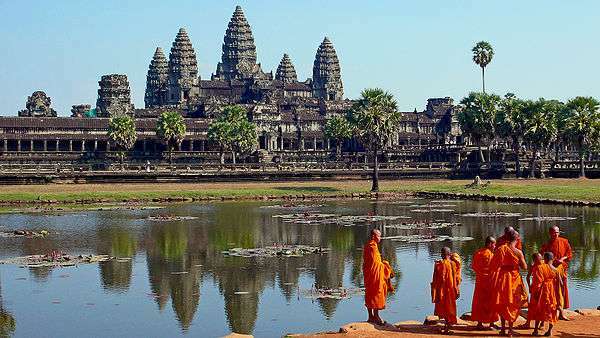 Angkor Wat អង្គរវត្ត means "city of temples". 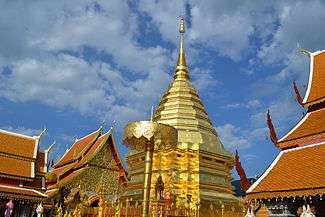 Royal temples (พระอารามหลวง; phra aram luang), established or patronised by the king or his family members. Private temples (วัดราษฎร์; wat rat), established by private citizens. Despite the term "private", private temples are opened to the public and are sites of public religious activities also. Samnak song (สำนักสงฆ์; samnak song) are temples without state endorsement and wisungkhamasima. bot โบสถ์ or ubosot อุโบสถ์ (from Pali uposatha) - the holiest prayer room, also called the "ordination hall" as it is where new monks take their vows. Architecturally it is similar to the vihara; the main differences are the eight cornerstones placed around the bot to ward off evil. The bot is usually more decorated than the viharn. multipurpose hall (Thai: ศาลาการเปรียญ, study hall) is a building in a wat. In the past this hall was only for monks to study in. The living quarters of the monks, including the กุฏิ (pronounced kut, kutti or kuti - monk cells) are separated from the sacred buildings. The roofs of Thai temples are often adorned with chofas. Look up wat in Wiktionary, the free dictionary.